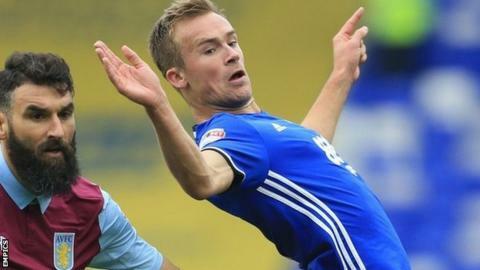 Birmingham City midfielder Maikel Kieftenbeld says Blues' improved away form has put them in a positive mood before Sunday's derby at Aston Villa. Six successive Championship wins have put Villa third, while Blues have lost just once in seven league games to go four points clear of the bottom three. The run started with a home win against Leeds, but Kieftenbeld maintains that then winning at Reading was crucial. "To win away at Reading was perhaps more important," he told BBC WM. "It gave us the feeling that we could score anywhere and beat any opponent." Having previously picked up just three points from their first 12 away matches this season, winning at the Madejski Stadium began an unbeaten four-match away run. Since the turn of the year, as well as winning at Reading, Blues have also beaten Sheffield Wednesday at Hillsborough on 3 February to supplement 1-1 draws at Preston and Premier League side Huddersfield Town in the FA Cup. Kieftenbeld sees the upturn in results as a reward for the public backing given by the Blues board to manager Steve Cotterill after a difficult start to his time in charge. "I'm happy for him," said the Dutch midfielder, 27. "It's hard for any manager without a pre-season. "Everybody knew it needed time but sometimes in football you don't always get that time. "From the start, the results were not there and we weren't playing well. We then started playing better and not getting results. "Now, over the last few weeks, we have started getting results." When Blues started this season under Harry Redknapp, Kieftenbeld was readying himself for a move to rejoin his old Blues boss Gary Rowett at Derby. That transfer broke down in August when the deal did not get done on deadline day because of an administrative error - and Kieftenbeld has stayed on at St Andrew's to become a key part of the revival under Cotterill, signing a new two-year deal in January. In only his third game back in the fold, he helped Blues to a 0-0 draw against Villa at St Andrew's in October - but he would love to go one better on Sunday. "They are the best games to play for Birmingham in my three years here," he said. "Not always in terms of the quality of the game, but in terms of the atmosphere. A lot of fans are in the stand well before the game and I can't wait for it. "I played five years for FC Groningen in the north of Holland and our derby game was against Heerenveen, but you can't compare it. The Blues-Villa game is a different level. "It's easy in terms of being ready and prepared for this one. I love to play in them. It will be my fifth derby and unfortunately I've never won one, but it would be massive for us to win on Sunday. "We've got a lot of confidence at the moment. They're doing well, but we've got the feeling that we're doing well too." Maikel Kieftenbeld was talking to BBC WM's Richard Wilford.